Lots of things are going on in Blogland right now. Have you all heard about "One World, One Heart"? Hundreds of bloggers from all over the world are connecting by joining this celebration, and offering prizes to visitors who leave comments. You can read more about this event by clicking on the emblem above, and you can visit tons of wonderful blogs you might not have know about before. I have a gift to offer as well. I'll be giving away the one of a kind, custom banner shown below, and I will customize it with your name. You can enter the drawing just by leaving a comment on this post. Please be sure you also leave a way for me to contact you, should you win. I'll be doing a random drawing for the winner on Feb.12, so all comments must be in by Feb.11. 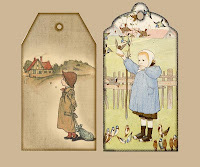 And since we're all in a sharing mood, I'd like to offer a little something for everyone, so here are some new primitive tags, based on antique children's book illustrations. Download these tags by clicking on the tab on the right that says "Click here for free Printable Primitive Tags". I hope you'll enjoy these, and that you can take some time to visit some of the fascinating folk who are participating in this event. TDIPT Mercantile updates tonight, with wonderful new work from this talented group. 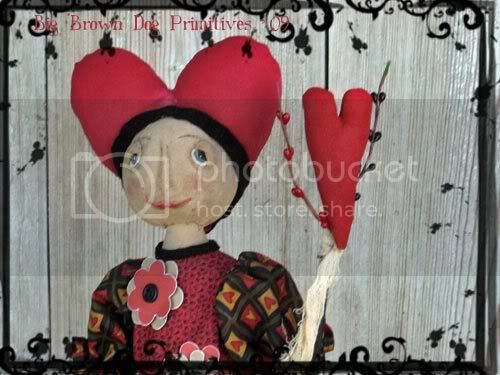 I have a new doll this time, a Queen of Hearts Make Do, that I'd love to have you see. Click on her picture to visit.